Fascinating pictorial study explains the reasons why the U.S. entered WWI and the violations by Germany that exacerbated the situation. Lavishly illustrated chapters cover development of U.S. Air Service and U.S. 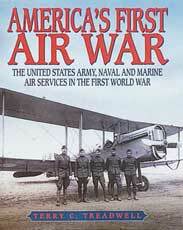 Naval Air Service and their first use of aircraft in combat. Highlights the personalities that emerged from the WWI. Contains original escape reports from USAS pilots and observers providing detailed insight into the conditions under which they were imprisoned. 176 pgs, HB, 7.5 x 9.75, 140 b/w photos.